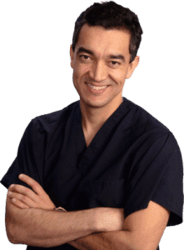 Trust your migraine surgery procedure to the best-reviewed plastic surgeon in Pittsburgh, PA.
Migraine headaches is a debilitating condition that affects 28 million people in the United States. The FDA has recently approved the use of Botox for the treatment of migraines. By paralyzing the muscles around the face, the headache triggers cease temporarily, thus providing relief from migraine symptoms. In addition, a series of surgical procedures for migraine surgery have been developed to permanently decompress nerves and improve these symptoms. If you have severe migraine headaches (>15 per month), set up a consultation to start exploring the best treatment for your condition. If you suffer from migraine headaches and traditional medicines have failed to offer relief, Dr. Julio Clavijo-Alvarez performs migraine surgery to help patients. Migraine surgery is a series of procedures geared to release nerves from your head and face to relieve the triggers points for migraines. Usually, patients who respond well to Botox injections are good candidates for this procedures. The migraine surgery is done in an accredited AAAASF and state certified facility or the hospital. It is done under general anesthesia. The duration of the procedure is about 2 to 6:30 hours depending on how many trigger points are released. It can be done as an outpatient procedure or as a 23 hours observation in the hospital. The answer is yes and no. When doing your migraine surgery we will use absorbable stitches. Despite the use of ointments and massage, we will need to remove some of the remaining stitches that did not fall or disappear. In this migraine surgery testimonial, Kristen talks about her experience at ReNova Plastic Surgery and the quality of care provided by Dr. Julio Clavijo-Alvarez. Kristen talks about her battle with migraines and the positive changes caused by migraine surgery. and the compassionate treatment she received at ReNova Plastic Surgery. How is the post-op recovery? The typical cost for Migraine Surgery near Pittsburgh, Pennsylvania ranges from $4,000 - $6,000. A few of the variables that determine costs of a procedure will vary by surgeon, geographic region and complexity of the procedure.